(CNN) -- American-born Edgar Valdez Villarreal, believed to be one of Mexico's most ruthless drug traffickers, was captured Monday, Mexican authorities said. Federal police made the capture, though the exact location and timing of it were not immediately known. The arrest, a high-profile win for Mexican authorities, followed "intelligence work" that began in June 2009, federal police said in a statement. His capture came after a shootout, according to Viviana Macias, a spokeswoman with the federal attorney general's office. Valdez, who is known as "La Barbie" because of his blue eyes and fair complexion, was a one-time top lieutenant of Mexico's most wanted man, Joaquin "El Chapo" Guzman. 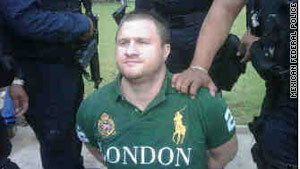 U.S. Justice Department officials offered in June a $2 million reward for information leading to the capture of the alleged cocaine kingpin. His arrest comes on the heels of another big blow against the drug cartels. Ignacio "Nacho" Coronel Villareal, a principle leader of the Sinaloa drug cartel, was killed during a military raid in July.